A new report shows how the United States is lining corporate executives’ pockets with tax dollars. Jeff Bezos at Amazon Spheres Grand Opening in Seattle. Wikimedia. Twitter users knew something was up last week when they noticed a bunch of accounts with “Amazon FC Ambassador” in their display names, saying things like “I actually do make a decent living working at Amazon” and “I can use the restroom anytime I want!” Suspicion was warranted: Amazon confirmed this week that it’s been giving perks to warehouse workers who tweet positive things about their employer. 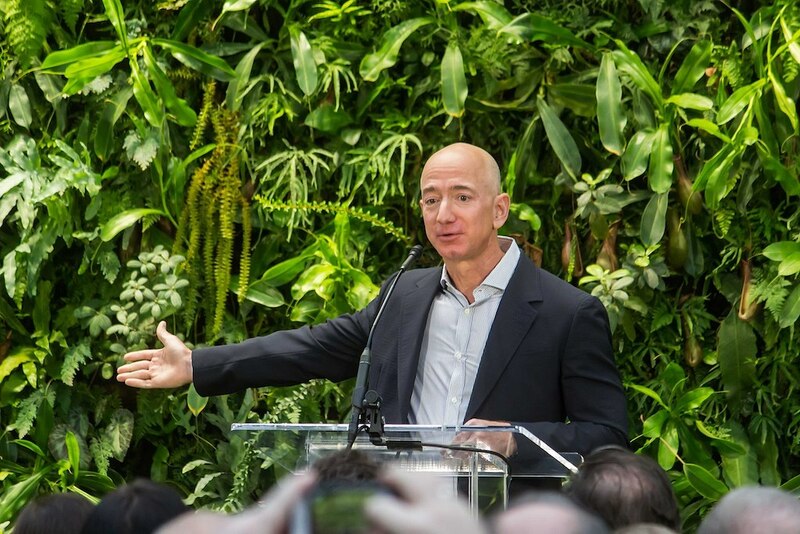 The astroturfing campaign comes amid escalating public scrutiny of Amazon, driven largely by Bernie Sanders’ near-daily criticism of its CEO Jeff Bezos. Sanders has been bashing Bezos in an effort to draw attention to a larger complex of related issues, from wealth inequality to labor abuses to corporate welfare. Bezos is exemplary on all counts: his company’s labor practices are abhorrent, he’s excessively rich, and the public subsidizes his profits through taxes. Taxpayers often subsidize corporate profits indirectly. The boss pays pennies or is stingy with benefits, and tax-funded public social programs make up the difference. Or the company receives a huge tax break and uses the money to line executives’ pockets. But as explored in a new report form the Institute for Policy studies, there are many corporations that receive direct public subsidies, too. And their CEO-to-median-worker pay ratios are out of control. The report, titled “How Taxpayers Subsidize Giant Corporate Pay Gaps,” looked at the top fifty federal contractors and the top fifty federal corporate subsidy recipients. It found that more than two-thirds of these companies paid their CEOs more than a hundred times their median worker pay. In these cases, taxpayers are in effect simply depositing money in a handful of rich people’s bank accounts. For example, American Airlines is like Amazon, in that a huge number of its employees receive public assistance because their compensation is so low. But American Airlines also received $16 million in public money in 2017. So where did that money go? Well, to give you a clue, the company’s CEO personally walked away with more than $12 million last year. Disturbingly, the report found that the corporations that received the most government funds often had the highest CEO-to-median-worker pay ratios. Thirty-four of the fifty federal contractors the report reviewed had ratios higher than a hundred to one, and federal subsidies to those thirty-four firms totaled $167 billion in 2017. The average ratio for all fifty top contractors was 188 to one, but the numbers soar way higher than that, and trend upward up as the federal money rolls in. For instance the Geo Group, a corrections contractor that operates private prisons and detention centers, paid its CEO 271 times more than its median employee salary. It received $663 million from the federal government in 2017. That’s bad, but it gets worse. In 2017, defense contractor Honeywell International had a pay ratio of 333 to one, and it received $4.4 billion in federal money. Meanwhile pharma giant McKesson had a pay ratio of 473 to one, and it received $8.8 billion from the federal government. The more public money we give these big companies, the more money they give to their executives. If you ask ordinary Americans what they think CEO-to-median-worker pay ratio should be, their answer is six to one — which is, quantitatively if not qualitatively, a lot closer to a socialist vision than to the current reality under capitalism. It’s obvious that no boss works 473 times harder than his average employee, so when we see a CEO-to-median-worker pay ratio of 473 to one, we’re forced to concede that there is some flaw in the system. But it’s not just the ratios that should bother us. The corporate welfare element adds a different dimension, and raises existential questions about the supposed values of our society. The inequality is bad enough. The fact that we’re paying to sustain it with money from our own paychecks that could otherwise go to public education, healthcare, housing, infrastructure, and the general betterment of us all… that should make us question the compatibility of capitalism and equality.